If you’re elderly, living with a disability or mental health condition, having your meals delivered to your home each day can be a real weight off your mind. Cooking for yourself, especially if you’re home alone, can start to feel like a chore. And while we all occasionally have a cheese sandwich or beans on toast instead of a proper dinner, if we do it all the time then we’re not enjoying a balanced diet and our health can suffer. For some people getting to the supermarket to do the grocery shopping is a complicated journey; perhaps they’ve handed in their driver’s licence, have mobility issues or their mental health condition makes a visit to the shopping centre impossible. Meals on Wheels can help people to remain living independently in their own home. It’s one of our most popular in-home care services, especially with seniors receiving assistance through an aged-care home care package. 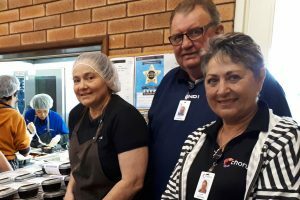 Julie Scott is the Meals Service Team Leader at Chorus Kitchen — our Meals on Wheels service, which operates in the cities of Melville, Fremantle, Cockburn, Rockingham, and Kwinana (including Baldivis). The meals are cooked by our three chefs and a group of dedicated volunteers and are delivered five days a week. They are cooked, “blast chilled”, refrigerated and then sent out for delivery by some of Chorus Kitchen’s 80 volunteer drivers. Julie said most people have one meal delivered but if you want two, that can be accommodated. “We’re very flexible with what we serve,” she said. “We have a meat menu and a vegetarian menu, and an alternative menu for people who can’t eat certain things. “If someone doesn’t like Brussel sprouts, we make a note of that and we don’t serve them Brussel sprouts. Some people need their food cut up small. Others can only eat soft food. “We can accommodate all these requirements.” That flexibility extends to the delivery arrangements. 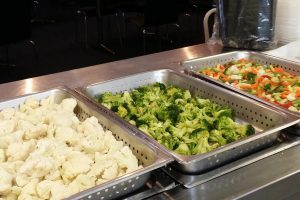 “Some people want seven days of meals but only delivered once a week, for example, so they’d have two fresh meals delivered and five frozen meals,” Julie said. What kind of meals are available from Chorus Kitchen? The Chorus Kitchen menu changes to suit the seasons, but our chefs also respond to customer demand. Here’s a real sample of a week’s meals from a recent menu. Here’s an example of the vegetarian menu, from the same week. Having a nutritionally balanced diet is important for everyone and Julie said Chorus Kitchen meals are planned and prepared with that in mind. As the menu above shows, special attention is paid to ensuring diabetic dietary requirements are met. “It’s quite a varied menu; we like to keep it interesting,” Julie said. “It’s not just meat and three vegetables — which is probably what a lot of older people have grown up with. Chorus Kitchen does not just drop your food at your door and dash off to the next delivery. Our volunteer drivers do welfare checks, too. Our drivers understand they might be the only person someone living home alone sees in a day, so they’re happy to stop and have a chat and see if they need anything. We like to know you’re OK; when you sign up to Chorus Kitchen, we ask for the details of an emergency contact person. If our driver knocks at the door and there’s no answer, they’ll call your emergency contact person. 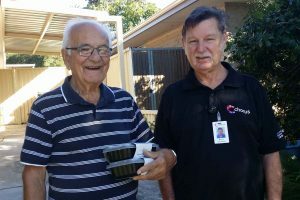 If you live in the Cities of Fremantle, East Fremantle, Melville, Cockburn, Kwinana and Rockingham and are interested in Chorus Kitchen’s Meals on Wheels service, call us on (08) 9339 7225 so we can help you live the life you choose.